As photographers, there tends to be a point during the busy season where we all start to feel burnt out. This can be from having too many clients, too many deadlines and obligations to family and friends. Here are a few suggestions on how to avoid burn out in order to make 2013 your best year yet! Make your post processing workflow as efficient as possible. Shoot with intention. Set a goal of getting it right in camera. Minutes spent correcting the exposure and adjusting the temperature are minutes that could be spent with your friends and family. To obtain proper exposure practice makes perfect. I shoot manually and use flash for consistency. This makes post processing more efficient because you can generally apply the same changes to images with identical exposure settings. To obtain accurate color utilize tools like ExpoDisk, X-Rite ColorChecker Passport, or the SpyderCHECKR. These tools will help get the color right in camera by minimizing the guesswork. Cull smarter. The question is, do you eliminate the bad or include the good? The thought process is different and can keep you from providing your clients with too many photos. If there are very slight differences in similar images include only the best one… not 8 of the same photos. Shoot less. It is not necessary to take 68 frames of the bouquet, edit them, and include them in the gallery. I’ve been there and done that. Know what you are photographing, how, and why. Keep these questions in mind to keep you from over-shooting. So make it easy on yourself. Get the shot and move on. That way you won’t have to waste time culling or editing images that will serve no purpose to the bride and groom. As the owner of a photography business, there are many things that take up the precious minutes of your day. These include administrative duties such as contracts and invoicing, organizing finances, client interaction, creative duties and marketing. So how can I do all this without compromising the quality of work? I started looking for opportunities to outsource some of my administrative operations. I discovered ShootQ and now my administrative work is a breeze. You know the saying “you never know what you have until it’s gone…” Well, I never knew what time I had until all of that extra work was gone. Granted, it took a very long time to set up, but once it’s done, you are golden. For some photographers, outsourcing creative aspects may be the best solution. Companies like Colorati, Fotofafa, and PWD Labs can cull, color correct, apply creative actions and design album layouts. Outsourcing this facet of your business definitely takes a lot of courage, but if the thought of culling through 3000 images and editing 1000 of them sounds dreadful this will save you lots of time. Another option is to hire an office manager to help you manage the day-to-day aspects of running your business. There is absolutely nothing wrong with wanting to make your clients happy. If you set realistic expectations of how long the images will take for you to process there will be fewer phone calls and emails asking when these images will be ready. Under promise and over deliver. 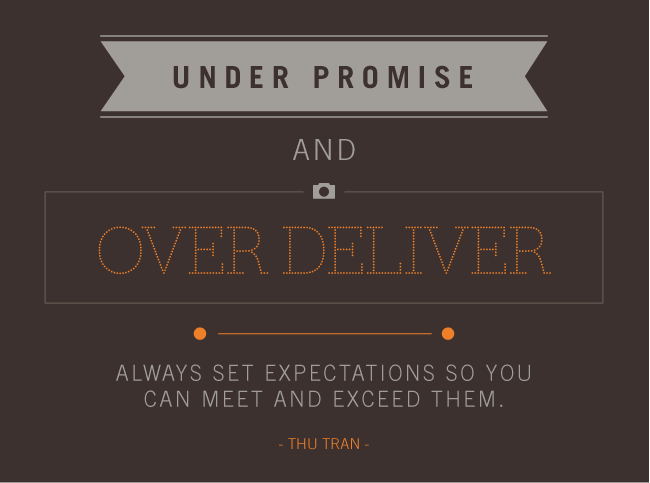 Always set expectations so you can meet and exceed them. Lastly, to avoid burn out you must make time for yourself. Two years ago I would stay up all night every night editing because that is when the house was quiet. As a result I was not feeling my best and my personal relationships suffered. My priorities needed to be checked. I sat down and made a list of what was important to me and what I could do to make my life more enjoyable. I try to exercise regularly. I find that maintaining an exercise regimen throughout the week keeps me happy and focused. I limit business matters to set business hours. This is a work in progress. But keeping a schedule from 9-5 or 7-3 has helped me create boundaries between my business and personal life. Don’t get bored with your work. Create projects to reinstate your love for photography. A different subject or even a different kind of camera can rejuvenate your creativity. Doing this will sharpen your technical skills and the creative stimulation will spill over into your work. Owning a business is a lot of work but there are many benefits to being self-employed. Why do we do this? For many it’s because they love photography and being creative. Others love the business aspect. And some, like me, may love all aspects of owning a photography business – the creativity involved, the business planning, and most of all the freedom. The freedom to have a flexible schedule, the freedom to make as little or as much money as my efforts provide, the freedom to do what I love. If you are not deriving joy from owning your business then try and make some changes. 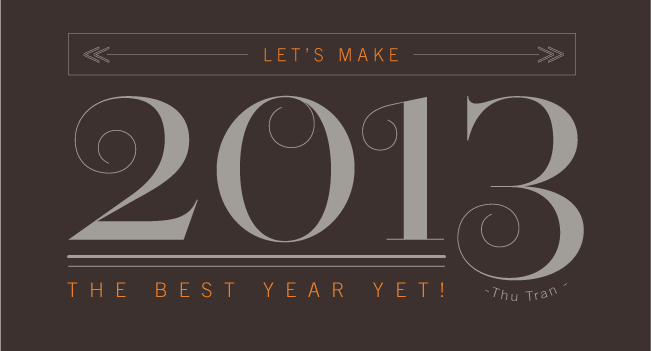 Let’s make 2013 the best year yet! Thu Tran is an Atlanta-based wedding photographer that has an affinity for details and all things pretty. She seeks to capture life and love with style and flare. This is so such a good read Thu! Th first mistake I made in my business was – like you – staying up until all hours working. I had no idea how much damage I was doing to my relationship but since I have learned to take time for me everything works better and although I seem to do less hours I get so much more done. You reach a point where you bcome counter-productive and it affects everything.